Above is a screenshot of a Macromedia Flash presentation featured at theBioMotionLab. As you can see, there is a figure made of light points in the center, and, off to the left, sliders corresponding to various characteristics (male, female, happy, sad, etc.). 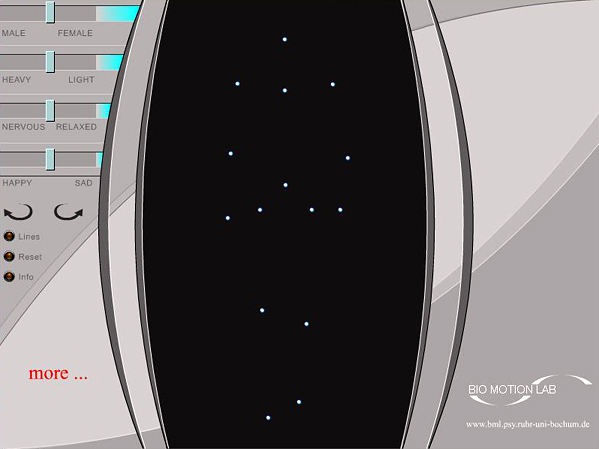 The way it works is this: in the actual Flash animation the light points are (of course) moving. You adjust the sliders and the posture and gait indicated by the light points changes accordingly. The lab is currently split into two parts, one located at Ruhr-University in Bochum, Germany, and the other at Queen's University in Kingston, Ontario. Playing with the sliders and watching the figure morph is lots of fun. It's also interesting to observe your own perceptions - the figure almost takes on bodily form, after a bit. My only question is, what are the cultural factors involved in these perceptions, and how can they be identified as such? Would observers from disparate cultures have similar perceptions? That would seem to be the key question. And since the experiment discusses the "psychology of social recognition", I guess this is the whole point - but also the most difficult question to answer, short of taking a statistically valid worldwide sampling. In any event, even more fun to play around with than it may look.